What can you expect (or not) from your skin and the products you use to care for your skin? You need a common sense approach to have healthy skin. What you do daily “shows up” in many ways… what you eat, how often you exercise, and especially how you treat the largest organ of your body. MYTH: There is no limit to how much your skin cells can multiply. FACT: Cells reproduce good and bad messages. When they receive harsh messages, cells and the tissue that connects them can forget to produce collagen and Hyalouronic acid (moisture). CONCLUSION: Exercise restraint with the use of AHA products such as retin A and in the number of microdermabrasion treatments you have, if any. SOLUTION: Premiere’s gentle exfoliating mask duo system. This system softens, cleanses, and exfoliates as well as gently removes excess dead cells without disturbing their rebuilding process. RESULTS: You will see a smoother, poreless, more radiant skin with fewer lines. You’ve always heard to mask once a week for 20 minutes, why not do the single best habit 5 minutes a day. My clients who have replaced their daily cleanser with a mask system see much more of what they like to see in the mirror. You can not just go to the dentist twice a year and expect healthy teeth and gums. Ah ha….you can not expect great skin by just having salon treatments. 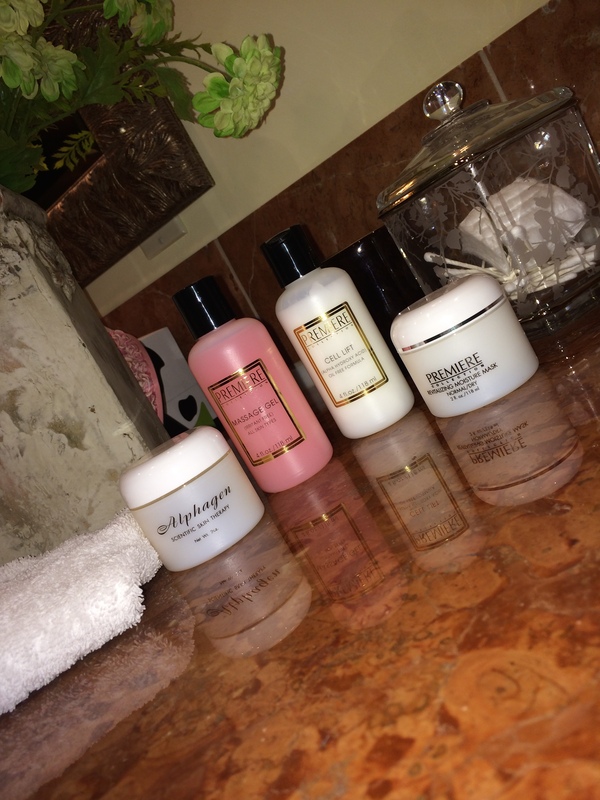 Premiere Collection offers 4 different daily mask choices depending on your skin needs. A favorite morning mask is Alphagen…applied as a thin transparent layer, it can be worn out on a jog or to a yoga class. Take a peek at our daily mask systems in the menu of my blog above to decide on the appropriate mask system to try or contact me and I’d be happy to assist. Posted on September 4, 2014, in Beauty, Exfoliation, Premiere Collection Skin Care and tagged beauty, daily masking, exfoliation, skincare. Bookmark the permalink. 3 Comments. What is the least amount of time I can wear the mast for it to be effective?